We are thrilled to bring members of talented Isle of Skye Highland Dancers from Dunedin, FL to demonstrate a variety of traditional Highland dances. The Isle of Skye Highland Dancers , under the direction of Lindsey Dubock Mallon, compete throughout the Southeastern United States. Many of the dancers performing today also perform and compete in piping and drumming with the Dunedin Middle, High School and Dunedin City Pipe Bands. Isle of Skye dancers have performed at the Sarasota Opera House and the Rialto Theatre in Atlanta, Georgia. 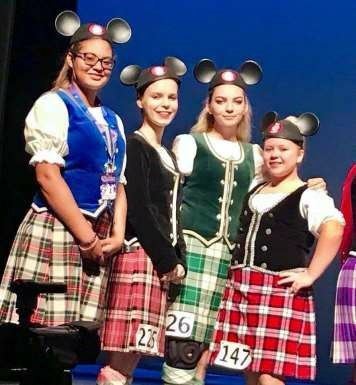 The Isle of Skye Choreomagic team recently won Best Overall Production and Best Overall Impression at the International Gathering of Scottish Highland Dance at the Orange County Convention Center and Walt Disney World. Dancers: Kennedy Poth, Madison Poth, Elizabeth Gogola, Ashlyn Welch and Victoria Rowley. The dances you will see today, though all loosely called Highland dances, are divided into Highland Dances and National dances. Highland Dances were originally performed only by men, often before and after battle, and require considerable stamina. Many of the National dances, however, were devised for female interpretation and are less athletic and more graceful. Authorities on dancing have said that Highland Dancing is one of the most sophisticated forms of national dancing known. The main points to look for while watching Highland Dancing are the precision and timing of the steps and the leg, body and arm positions. The dancer should appear relaxed and well in control of the movements. Since 1950 the Scottish Official Board of Highland Dancing (SOBHD) has set standards for performance and judge’s scoring. There are many accepted steps for each dance, some of which are required in competition by the SOBHD and others, which are optional. All dancers do not, therefore, dance the same steps.